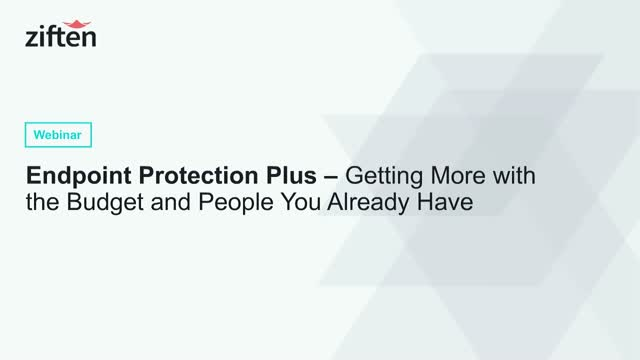 We simplify endpoint protection plus visibility. We simplify endpoint protection plus visibility. Ziften’s cloud-delivered endpoint protection platform prevents attacks on all enterprise endpoints – laptops, desktops, servers, and cloud – whether on network or off. The low-profile single agent deploys in minutes enabling (1) advanced AV, (2) endpoint detection and response, (3) plus endpoint visibility and hardening. The result is simple, continuous endpoint protection to stop attacks with the people and budget you already have. Ziften protects enterprises using artificial intelligence (AI) to prevent and detect cyber-attacks from zero-day and polymorphic malware, to weaponized documents, to fileless attacks through even the most complex obfuscation and mutations. Attackers love your endpoints. And why not? Most endpoints aren’t patched. User’s disable security tools. Traditional AV won’t stop attackers. And when they get in, it takes months to find them. Then, the incident response nightmare begins. Let’s face it, endpoint protection can be complex. And selecting the right solutions can be confusing. • What different analysts are saying about today’s endpoint protection marketplace. • Recent stats that indicate the struggles security teams continue to have. • Key things to consider when looking at endpoint protection platforms. Ransomware has gone from “on the radar” to a Code 5 level threat with the rise of “ransomworms” snaking through global networks in hundreds of countries. Your employees are the front line of defense, and IT and security teams are tasked with protection, detection and response. But nobody knows how the next ransomware strain will take shape and teams are rarely, if ever, properly coordinated. Dr. Al Hartmann is the Chief Scientist at Ziften since 2009, focused on data analysis of user and endpoint behavior to drive critical situational awareness of enterprise cyber activity for security and operations management. Prior to co-founding Ziften, Dr. Hartmann was a senior researcher with Symantec's Research Labs and Technology Scouting Group, performing research in system cybersecurity and application quality of service.